Harry Truman (1884-1972), the 33rd U.S. president, assumed office following the death of President Franklin Roosevelt (1882-1945). In the White House from 1945 to 1953, Truman made the decision to use the atomic bomb against Japan, helped rebuild postwar Europe, worked to contain communism and led the United States into the Korean War (1950-1953). A Missouri native, Truman assisted in running his family farm after high school and served in World War I (1914-1918). He began his political career in 1922 as a county judge in Missouri and was elected to the U.S. Senate in 1934. Three months after becoming vice president in 1945, the plain-spoken Truman ascended to the presidency. In 1948, he was reelected in an upset over Republican Thomas Dewey (1902-1971). After leaving office, Truman spent his remaining two decades in Independence, Missouri, where he established his presidential library. 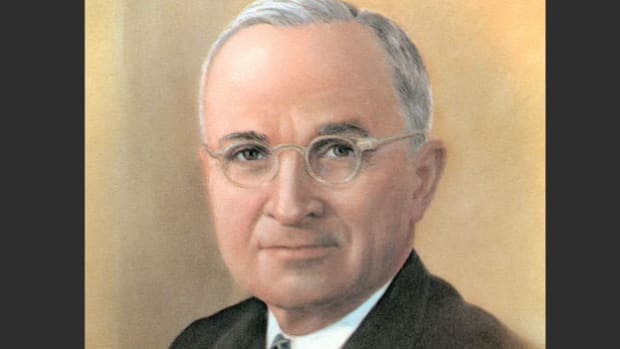 Harry S. Truman was born on May 8, 1884, in the farm community of Lamar, Missouri, to John Truman (1851-1914), a livestock trader, and Martha Young Truman (1852-1947). (Truman’s parents gave him the middle initial S to honor his grandfathers, Anderson Shipp Truman and Solomon Young, although the S didn’t stand for a specific name.) In 1890, the Trumans settled in Independence, Missouri, where Harry attended school and was a strong student. As a child, he had to wear thick eyeglasses due to poor vision, and his doctor advised him not to play sports in order to avoid breaking them. Truman had hoped to attend the U.S. military academy at West Point, but his eyesight prevented him from gaining admittance. Did you know? On November 1, 1950, two Puerto Rican pro-independence activists tried to assassinate President Truman at the Blair House in Washington, where he was living while the White House was under renovation. Truman was unharmed, although a police officer and one of the would-be assassins were killed. 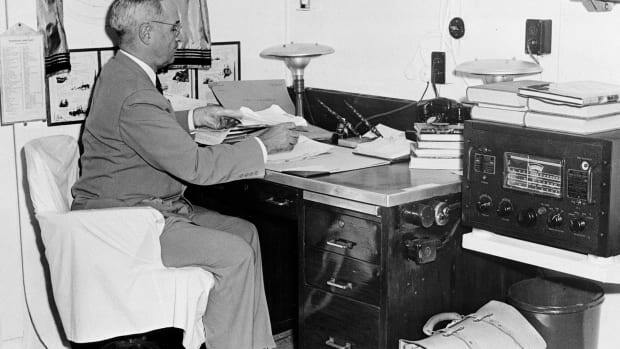 Truman’s family could not afford to send him to college, so after graduating high school in 1901 he worked as a bank clerk and held various other jobs. Starting in 1906, he spent over a decade helping his father manage the family’s 600-acre farm near Grandview, Missouri. During this time, Truman also served in the Missouri National Guard. In 1917, when America entered World War I, Truman, then in his early 30s, reenlisted in the National Guard and was sent to France. He saw action in several campaigns and was promoted to captain of his artillery unit. In 1919, after returning from the war, Truman married Elizabeth “Bess” Wallace (1885-1982), his childhood classmate. That same year, Truman and a friend opened a men’s clothing store in Kansas City; however, the business closed in 1922 due to a poor economy. 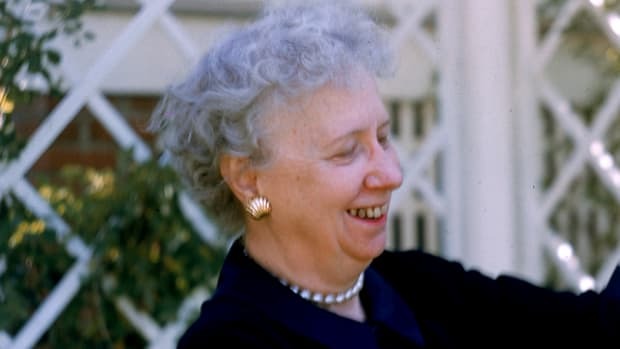 The Trumans had one daughter, Mary Margaret Truman (1924-2008), who grew up to become a professional singer and author of biographies and mystery novels. In 1922, Harry Truman, with the backing of Kansas City political boss Thomas Pendergast (1873-1945), was elected district judge in Jackson County, Missouri, an administrative position that involved handling the county’s finances, public works projects and other affairs. In 1926, Truman won election as the county’s presiding judge. Earning a reputation for efficiency and integrity, he was reelected in 1930. In 1934, Truman was elected to the U.S. Senate. As a senator, he supported President Franklin Roosevelt’s New Deal programs, designed to help lift the nation out of the Great Depression, which began in 1929 and lasted about a decade. Additionally, Truman was instrumental in the passage of the Civil Aeronautics Act of 1938, which established government regulation of the burgeoning aviation industry, and the Transportation Act of 1940, which established new federal regulations for America’s railroad, shipping and trucking industries. From 1941 to 1944, Truman headed the Senate Special Committee to Investigate the National Defense Program, which worked to reduce waste and mismanagement in U.S. military spending. Commonly known as the Truman Committee, it saved American taxpayers millions of dollars and propelled Truman into the national spotlight. In 1944, as Roosevelt sought an unprecedented fourth term as president, Truman was selected as his running mate, replacing Vice President Henry Wallace (1888-1965), a divisive figure in the Democratic Party. (Truman, a moderate Democrat, was jokingly referred to as the “second Missouri Compromise.”) In the general election, Roosevelt easily defeated Republican Thomas Dewey, the governor of New York, and was sworn into office on January 20, 1945. Less than three months later, on April 12, 1945, the president died suddenly of a cerebral hemorrhage at age 63. Upon assuming the presidency, Harry Truman, who had met privately with Roosevelt only a few times before his death and had never been informed by the president about the construction of the atomic bomb, faced a series of monumental challenges and decisions. During Truman’s initial months in office, the war in Europe ended when the Allies accepted Nazi Germany’s surrender on May 8; the United Nations charter was signed; and the president participated in the Potsdam Conference to discuss postwar treatment of Germany with Great Britain’s Winston Churchill (1874-1965) and the Soviet Union’s Joseph Stalin (1878-1953). In an effort to end the war in the Pacific and prevent the massive U.S. casualties that could result from an invasion of Japan, Truman approved the dropping of atomic bombs on the Japanese cities of Hiroshima (on August 6) and Nagasaki (on August 9). Japan’s surrender was announced on August 14, 1945; however, Truman’s use of the atomic bomb continues to be one of the most controversial decisions of any American president. In the aftermath of the war, the Truman administration had to contend with deteriorating U.S.-Soviet relations and the start of the Cold War (1946-1991). The president adopted a policy of containment toward Soviet expansion and the spread of communism. In 1947, he introduced the Truman Doctrine to provide aid to Greece and Turkey in an effort to protect them from communist aggression. That same year, Truman also instituted the Marshall Plan, which gave billions of dollars in aid to help stimulate economic recovery in European nations. (The president defended the plan by stating that communism would thrive in economically depressed regions.) In 1948, Truman initiated an airlift of food and other supplies to the Western-held sectors of Berlin, Germany, that were blockaded by the Soviets. He also recognized the new state of Israel. 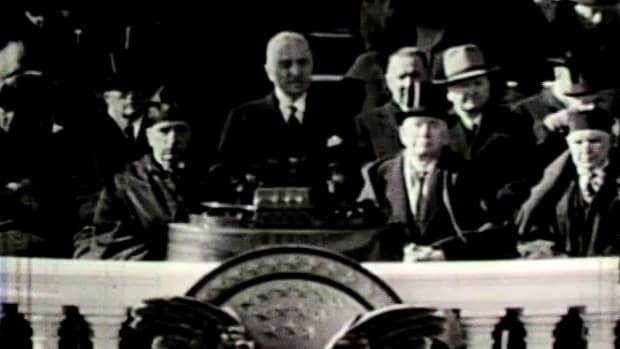 Harry Truman was sworn in for his second term in January 1949; his inauguration was the first to be nationally televised. 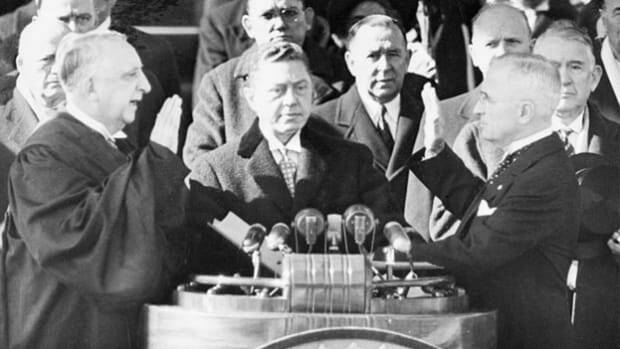 The president set forth an ambitious social reform agenda, known as the Fair Deal, which included national medical insurance, federal housing programs, a higher minimum wage, assistance for farmers, repeal of the Taft-Hartley labor act, increases in Social Security and civil rights reforms. 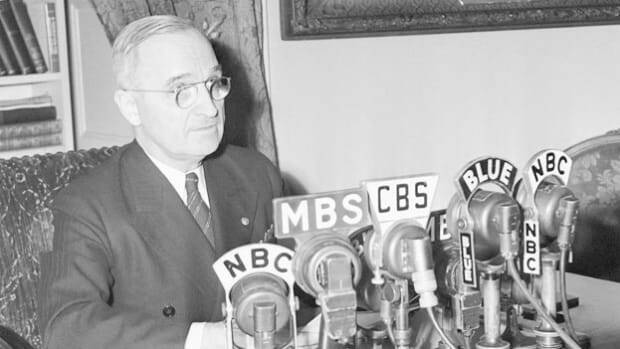 Truman’s proposals were largely blocked by conservatives in Congress; however, he had some legislative successes, such as the Housing Act of 1949, and also issued executive orders (at the end of his first term) to end segregation in the U.S. armed forces and to prohibit discrimination in federal government jobs. The threat of communism continued to be a major focus of Truman’s second administration. The president supported the creation in 1949 of the North Atlantic Treaty Organization (NATO), a military alliance of democratic nations, including the United States, Canada, France, the United Kingdom and eight other countries, and appointed Dwight Eisenhower (1890-1969) as its first commander. Also that year, a revolution in China brought the Communists to power, and the Soviets tested their first nuclear weapon. Additionally, during his second term Truman had to contend with unproven accusations made by U.S. Senator Joseph McCarthy (1908-1957) of Wisconsin that the president’s administration and the U.S. State Department, among other organizations, had been infiltrated by communist spies. In June 1950, when communist forces from North Korea invaded South Korea, Truman sent in U.S. planes, ships and ground troops to aid the South Koreans. The conflict turned into a lengthy stalemate that left Americans frustrated and hurt Truman’s popularity; however, his decision to intervene ultimately preserved South Korea’s independence. Although he was eligible to run for another presidential term, Truman announced in March 1952 that he would not do so. In that year’s general election, Democrat Adlai Stevenson (1900-1965), the governor of Illinois, was defeated by Republican Dwight Eisenhower. After Eisenhower’s inauguration in January 1953, Harry and Bess Truman traveled by train from Washington to their home in Independence. There the former president penned his memoirs, met with visitors, continued his habit of brisk daily walks and raised funds for the Harry S. Truman Presidential Library, which opened in Independence in 1957. Truman died at age 88 on December 26, 1972, in Kansas City, Missouri. He was buried in the courtyard of the Truman Library. His wife, who died at age 97 in 1982, was buried beside him.